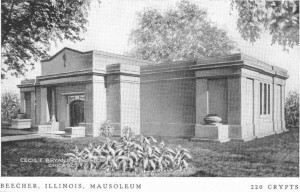 On March 1, 1912, a reference to a proposed mausoleum appeared in the Herald. A company, unnamed in the article, had agreed to erect the building on the condition that it would contain 100 or more crypts. The article continued, “The building itself can never be destroyed by storm or fire, as there is no wood in its construction. The upkeep of the building is provided for, as there is $5 set aside for each crypt. This fund is put out on interest, which is sufficient to pay for sweeping and washing inside the building when necessary. The control of this fund is left entirely with the people who own the crypts in the building. Each crypt holder gets a deed to his crypt. There are no taxes or assessments.” The cost for a crypt was to be $200. On March 22nd a picture of the propped mausoleum appeared in the Beecher Herald along with further arguments to persuade the populace that the building, a New Light mausoleum, would be an asset to the community. A lengthy caption included these remarks: “The old method of disposing of the dead is being denounced by the best medical authorities of the world as being unscientific, unsanitary, repulsive, and wholly unworthy of our enlightened age.” The picture showed a substantially larger building than the one eventually erected. Over the entry, there was a stone portico with a heavy pediment and massive double stone pillars. The wings were broader, and each had at the end another pediment and pillars. “On an ideal site to be selected by the patrons, it is planned to erect a building which for beauty, elegance, durability, strength and sacredness of purpose will be unsurpassed anywhere. This building will be a mausoleum, a place to entomb our sacred dead above ground. Within this mighty structure, a monument which for magnificence, dignity and durability cannot be surpassed, fathers, mothers, brothers, sisters, husbands and wives can lie side by side through the long, eternal sleep, each preserving the human form, separated only by the walls of their chambers, calm and peaceful and a source of satisfaction to those of the living, who know they have done the best thing possible for their loved ones and are themselves saved from the pangs of sorrow incident to the thought of the horrible consequences of earth burial. “There exists in every community a constant growing demand for a better method of caring for the dean than that offered by ground interment. The compartmented mausoleum offers a better way. The bodies placed in the crypts of the mausoleum are preserved in their natural form and entirety. There can be no doubt but that the perfect(ly) formed human body will be just as pleasing to the Creator on the day of the resurrection as the dust or ashes from which it might have been made. “How often have we been horrified at what we see at funerals: the downpours of rain, the watery grave, the sound of earth falling on the coffin lid, and especially is it heart-rending if it is our own loved one that is thus being put from our sight? “It matters not after a funeral in a mausoleum how fierce the storm, how dark the night, how wet the ground, those who parted that day for the last time from the loved ones can lie down and sleep in peace, feeling that the dear one is beyond the rain, the storm, the wet, lying in peach and dryness, symbolic of the repose in the better world. “If you want something that is not only just a little bit better than anything else, but the best to be had, you will find it in the mausoleum. The makeup of the front page of the Herald always included advertisements. The ads were not identified as such, and at first they often seemed to be news stories. Even knowing that this was the case, a reader of this mausoleum article probably was well into the first paragraph before tumbling to the fact that it was a commercial essay. The mausoleum was said to be “one of the best ever constructed.’ The whole basic structure would be concrete. The interior walls would be covered with slabs of marble. The exterior would be finished with Bedford stone. “The building will be so constructed that it will be non-destructible and will be everlasting.” It was estimated that it would take two to three months to finish the work. On July 25th the paper carried the news that it was expected that by the following evening all 210 crypts, including the family compartments, would have been formed. All the rough work was scheduled to be finished by August 15th. Be December 1913 the building was nearly complete. The mausoleum was to include a historical vault in which copies of the Eastern Will Union published in 1879 and the Beecher Herald were to be sealed along with a history of Beecher, a history of Washington Township and a variety of relics. The number of years that the vault was to be sealed was not given, but the article included a request for donations for the time capsule. Henry Thielman, a real estate speculator and vice president of the German American Land Company (headquarters at 84-86 Washington Street, Chicago; field offices at Stuttgart, Arkansas), moved to Beecher in 1899. His ads ran constantly in the Herald, and he was an ardent supporter of causes that he thought beneficial to the village. Occasionally, he was moved to take pen in hand and write lengthy articles. Thielman and his wife were members of the Congregational church (now Community church). They built a pleasant southern style house and made it a center for numerous social affairs. Arthur Struve was born at Monee on June 11th, 1870. His parents moved to Beecher when he was a year old. William Struve, his granddaughter, was a German immigrant who died before he could settle his wife and six children in a new home in America. His wife died soon afterwards. The children dispersed, and a son, also named William, made his way via the newly completed Illinois Central Railroad, to Monee, where he set up the first lumberyard. His business was successful, and he began to acquire real estate. He served in the Civil War and was with Sherman on the march from Atlanta to the sea. William Struve came to Beecher about the time it was incorporated and established a lumberyard adjacent to the railroad tracks. After twenty-five years he turned the business over to his son, Arthur. William Struve, although not a member of the Congregational church, made generous contributions to it. He died December 1, 1894. Arthur married Carrie Keepmeyer, the daughter of Mr. and Mrs. Henry Keepmeyer of Beecher, in 1895. They had one daughter, Rosa (Rosamunda). Arthur continued in the lumber business until 1895, when he sold the yard and turned his attention to banking. The First National Bank of Beecher was organized in 1896 with Struve as its president. Fred Wilkes was vice president and Carl Ehrhardt was cashier. In 1906 a new bank building owned jointly by Struve and Thomas Clark was erected. A stone marker over the front door of the building at Reed and Penfield reads “Clark-Bank Block.” (The second floor, Clark-Struve hall, was the site of parties, meetings of fraternal organizations, graduation festivities, and many many dances.) In 1916 the First National Bank was sold by Struve to Herman Ehlers and E. C. Curtis. IN addition to his banking interests Struve also was treasurer of the short-lived Eastern Illinois Brick Company, and he was a member of the Masonic fraternity in Crete, the Elks Lodge at Kankakee, and the Modern Woodmen camp in Beecher. The Stuves’ house, known most recently as the Kirk house and before that as the Bunte residence, was one of the most beautiful in Beecher. It was torn down a few years ago to provide space for an expanding business. 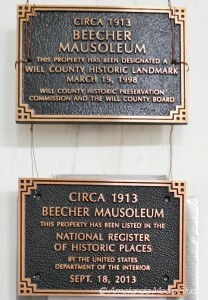 The Beecher Community Historical Society presented a list of artifacts in the house that, in the event that the building was destroyed, they would like to obtain, by purchase or otherwise, but the effort was fruitless. However, the society has two parquet blocks from the floor, the gift of Paula Franke, and the finial from the cylindrical tower, obtained by Wayne Wiechen. The Beecher mausoleum is located at the southwest edge of St. Luke’s cemetery, east of Route 1, Beecher. The first entombment probably was Anna Hack, who died on December 10th, 1914. In 1985 members of the Beecher Community Historical Society (Jeanne Cooper, Wally Franke, Lorna Bunte, and Lorna Wiechen) made very thorough readings of Beecher area cemeteries and mausoleum. These readings were published, unaccredited to the society, by the South Suburban Genealogical and Historical Society. (In recent years, prior to the Beecher historical society’s project, two other sets of readings were made, one by Maryan Mulcahy  and another by Don and Shirley Witt .) Society members reported extensive deterioration to the mausoleum when they made their study in 1985. Space does not permit a complete listing of the names of people entombed at the mausoleum and their dates, but the following is a list of family names: Bahlman, Bahlmann, Bergmeier, Beseke, Bielfeldt, Bohl, Brown, Cloidt, Dunlap, Fenske, Fick, Fiene, Freerking, Frobose, Gerhardt, Graham, Guritz, Hack, Hank, Hager, Haltenhof, Heine, Heldt, Hinze, Hoffman, Hoppensteadt, Horn, Hunte, Kaczynski, Kappe, Kilborn, Miley, Monk, Niedert, Ohlendorf, Pansa, Peters, Pralle, Riley, Ristenpart, Rohe, Rust, Saller, Selk, Struve, Thielman, Vagt, Von Engeln, Wegert, Wehmhoefer, Westphal, Wiechen, Wilkening, and Williams. Harry Kirchhoff (d. 1912) and Louis Kirchhoff (d. 1912) apparently were re-entombed at the mausoleum after it was built. Clifford Batterman and Caroline Deutsch, originally in the mausoleum, were removed and buried in St. Luke’s cemetery. The last person to be interred at the mausoleum was Dorothy Saller, who died in 1992.